— Austin Police Dept (@Austin_Police) 21 март 2018 г. The mysterious "serial bomber" that terrorized Texans is no more, as cell phone triangulation techniques revealed the Round Rock, TX hotel, where the suspect was hiding, and SWAT teams swooped in to enter in a car chase with him. According to the chief of Austin Police, Brian Manley, "as members of the Austin police department SWAT team approached the vehicle, the suspect detonated a bomb inside, knocking one of our SWAT officers back, and one of our SWAT officers fired at the suspect as well." The deceased was only identified as a "24-year-old white male," as it still has to have his identity confirmed, and family notified. He was responsible for a string of high-profile bombings that had killed two people so far, sending mail packages that detonate. 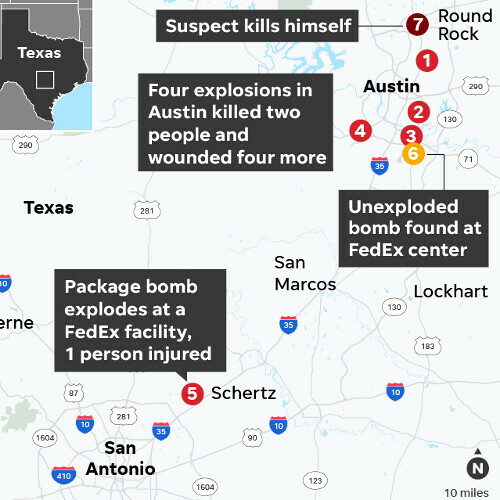 One such package exploded in a FedEx storage yesterday near San Antonio, and the postage on it helped identify the sender. Later on, combining knowledge from the Google searches on his computer, and triangulation results from his cell phone, the authorities were able to pinpoint the exact location of the bomber, resulting in the SWAT raid on the hotel hideaway. While triangulation is based on cell phone towers that the phone connects to, and is not as precise as GPS coordinates, it has gotten pretty reliable with time, combining hybrid tracking techniques to find someone within a 100-feet radius with a great degree of certainty. Thank you to all the brave men and women in law enforcement for all your hard work. How come no one ever thanks the hard working people in telecom that make stuff like this happen? "Nabs" him after 3 weeks of search...not good for the US law enforcement. Why no one call him a terrorist? This is America; terrorists can't be white. Sarcasm aside, I've often wondered the same thing. At the end of the day, if people are being terrorized, isn't the person committing the act a terrorist? Sadly, critical thinking and reason don't carry the day in our country. Twitter zings and sound bites are all most people need. He's not a "terrorist" because he's likely a local citizen, and many Americans see terrorists only as non-Americans attacking America*. *exceptions have been made for instances involving non-Christian American attackers. This was 100% a terrorist attack, and yes, it looks like it was homegrown.